If you’ve seen my review, you’ll know I’m absolutely in love with Sam Hawke’s debut fantasy novel, City of Lies. I was so in love with it that I had to ask Sam Hawke over for an interview. And luckily for me, she agreed! 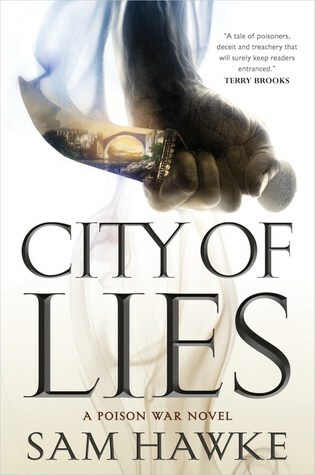 For readers you may be unfamiliar with it, can you describe City of Lies? City of Lies is kind of my homage to my two great loves — big secondary world epic fantasy and tense twisty slow burn closed mysteries. In short, it’s about a brother and sister who are charged with protecting the ruling family. When the current Chancellor is killed by an unknown poison and an army lays siege to the city, Jovan and Kalina have to try to unmask the traitor on the Council and find a way to end the siege before the new Chancellor — their best childhood friend — is murdered, or the city falls. If you like treacherous politics, sieges, old ancient magic returning, and of course, poisons, this might be your jam. City of Lies is your debut novel. What has the publication process been like? Very long, and pretty bog-standard, I think. You hear all of these crazy stories about publishing experiences and the way people find agents — twitter pitches and big auctions and serendipitous circumstances but really those are outliers, and most people find their way through it in the standard, boring way: sent queries, got some requests and some rejections, got agent, got publisher, waited for the death of 1000 suns, book finally came out (though, as at time of writing this, it’s not out quite yet, so you never know, the wrong sun could die before then and ruin everything). Something that really stood out to me about City of Lies was that both protagonists were disabled – Jovan is mentally ill, and Kalina has chronic illness. Can you talk about why you made this decision and how you went about writing these aspects of the characters? Mental illness and physical disabilities are real, they’re prevalent, they’re something that a lot of people have to deal with in their everyday lives. But I guess I feel like it doesn’t get enough representation in fiction as just a feature of characters’ lives – it’s more often presented as a Big Problem (ie the person’s struggles with it are the point of the book) or sometimes just a lazy trope (this character has OCD, so they must wash their hands a lot and they’re probably a mathematical genius with bad social skills!). Sometimes people with disabilities should get to be the heroes too. The story isn’t about those disabilities, but the effect that they have on the characters’ lives is still an important part of how I shaped the narrative from the beginning, particularly in relation to how the characters have developed coping strategies and workarounds to assist, and how different people in their lives can help or hinder. What was the inspiration for the world of City of Lies? What is the most interesting thing you learned while writing City of Lies? I’m a bit leery of advice because it’s all so subjective. So I’ll keep it simple. Be willing to listen to advice and give things a try, but ultimately you have to back yourself and believe you’re telling a story worth telling. Be kind. A lot of publishing is frustrating and slow and it can make you crazy if you let it, but know that people work in it because they love it and barely anyone is making pots of money, so be generous with your patience and understanding. I’m a massive homebody so probably ideally just chilling at home, reading on the couch with my kids playing nearby and my dogs at my feet. What are you working on now? Do you have any other new releases we should be watching out for? I tend to go stir crazy after three days. I’m a homebody too, but I’ve got my limits.